uniform temperature for your food. 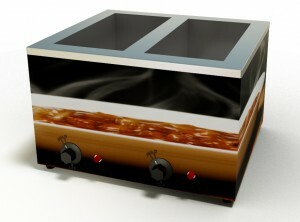 The countertop warmer unit utilizes our unique DRI-Channel technology, to hold soups, sauces, hot toppings and more, without the need for hot water. 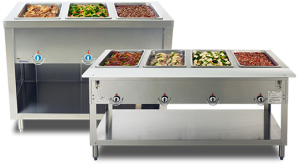 Duke offers two complete steamtable lines - AeroHot and Thurmaduke, in both gas and electric with many accessories and options. AeroHot offers an easy-to-assemble, economical option with many configuration options, while Thurmaduke is our fully-assembled, premium option, with unlimited accessories. 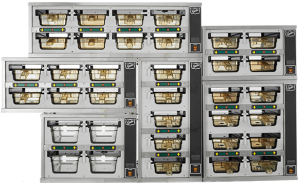 Our wide variety of holding solutions includes our standard hot, cold, and dual temp drop-ins as well as our patented dry holding option, the DRI-Channel, and patented N7 approved TRI-Channel, which merchandises food flush with the countertop, as well as our hot/cold convertible model.